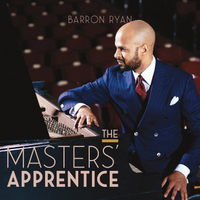 Seeking to learn from some of the world’s greatest artists, Barron Ryan meticulously listened to eleven of their recorded improvisations, wrote these down as sheet music, and learned to perform them. This album was born of failure. I failed to get into famous graduate schools, to fluently play piano by hear, and to heed my piano teacher’s advice when he instructed me to minimize tension while playing. Yet you hold something that looks suspiciously like success. Why focus on past disappointments? Because while seeing success is exhilarating and inspiring, it can also make you feel inadequate. Once they’re made, excellent things seem inevitable—obviously all that happened beforehand led to this beautiful result. That fanciful (and false) narrative may cause despair because you don’t feel destined to produce any such greatness. So I talk about my failings to remind you that the result of this album was never guaranteed. I’ve had many doubts, and for a time didn’t know that this recording would even happen (more about that in the videos related to this album at barronryan.com). May that reassure you regardless of whether you’re trying to record an album, find the right job, or be a better friend. None of us know how the stories that we’re living will unfold. To find out, you just have to keep going.